Ripple’s XRP cryptocurrency is up more than 5% Monday morning. The surge comes after rumours surfaced overnight that Coinbase was planning to support XRP. 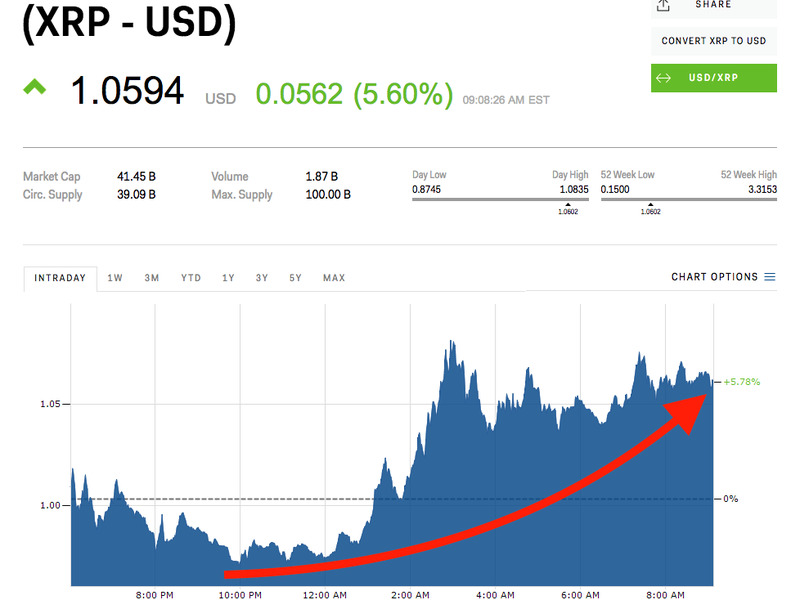 XRP, the cryptocurrency designed and controlled by Ripple for cross-border payments, is up more than 5% Monday after rumours swirled once again that popular cryptocurrency exchange Coinbase was considering adding XRP to its lineup. The surge comes the day before Ripple CEO Brad Garlinghouse is scheduled to appear on CNBC’s Fast Money program on Tuesday evening alongside Coinbase President Asiff Hirji and two other cryptocurrency executives, fuelling fresh rumours that the exchange might announce support for XRP. Neither Coinbase nor Ripple responded to a request for comment. It’s likely that CNBC convened the panel to discuss cryptocurrency trends, and not for any announcement by either company. XRP is currently one of the more difficult cryptocurrencies to buy, thanks to it not being on major retail exchanges like Coinbase. Despite that, XRP is the third-largest digital coin by market capitalisation. Business Insider has an explainer on how to purchase XRP here. Ripple, which owns a majority of XRP in escrow, has tried to distance itself from speculative and recently volatile cryptocurrency markets through a three-part series about its vision and strategy. The company has also announced several new customers on its liquidity and settlement products in 2018. Last week, Ripple said it had signed Fleetcor and Cambridge Global Payments to its xRapid and xCurrent products. They join a consortium of companies including Santander, UBS, American Express and more that are in various stages of using XRP for business. XRP is down 48% since January 1, while bitcoin is down 14% and ethereum is up 14%.